I found this amazing piece at a beach in Glenelg, Adelaide South Australia. I found it immediately on arrival and nothing else apart from a few bits of sharp amber and greens. I was gobsmacked! Such a beautiful piece in my favourite colour, seafoam. Will make a stunning pendant! Oh, what a lovely piece! So glad you found it! Enjoy! I am sure you are very happy! 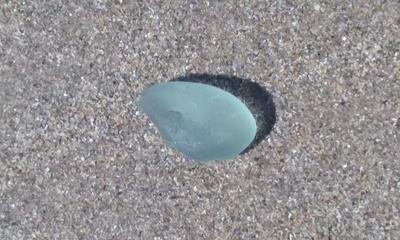 That is a beautiful piece of sea glass.